The Book of Qualities presents 74 qualities--including Pleasure, Anger, Terror, Beauty, and Change as everyday characters who live among us. Both personal and impersonal, the Qualities convey a variety of human emotions in a simple and entertaining manner; readers are inspired to reflect on their own qualities and communicate their feelings with new clarity. When I was a little girl, I made up a story about the store where they sell Qualities. More like a trading post or library than a department store or supermarket, we could go to the store where they sell Qualities to taste, try on, and sample various qualities. From time to time as a teenager I made notes about the factory where they manufacture facts and the image warehouse where they store belief systems. As I committed myself more seriously to writing Qualities, I began to consider the limits of emotional language. We often assume we know the dimensions of an emotional quality and whether it is good or bad without taking the time to see where the quality can take us and what it can teach us. During the process of writing The Book of Qualities I felt like an explorer trying to penetrate underneath the layers and stereotypes to experience the Qualities more directly. I was turning my skills in investigation and observation inward, focusing on the textures and colors of the emotional landscape, calling on my training as both a journalist and an artist. The Qualities seem to exist in a community of their own, apart from us, and simultaneously, they are very familiar, a part of our everyday world. I imagine that the Qualities live together in a town--Courage lives on the same block as Fear. Faith and Doubt are in the same apartment building; Despair hangs out in the basement. However, I don't want to emphasize the Town of Qualities too much because it implies that the Qualities are separate from us, and they seem to be both in and around us. Reading the Qualities aloud brings them to life; even the same Qualities change subtly in response to the moods and needs of the people listening. The Qualities continue to open doors in several directions at once. I am interested in the difference between similar Qualities such as Joy and Ecstasy, Contentment and Pleasure and the relationships between seeming opposites like Certainty and Confusion, Beauty and Ugliness. What happens when Courage and Simplicity work on a project together, when Pleasure and Sufficiency take a walk? Somewhere around the New Year I choose a Quality for the year and then pick one out of a bowl of Qualities, walking between the one I choose and the one that chose me. Each Quality has its own challenges and gifts. Click on the following images to view the sample pages. Enter your zip code and click the BookSense button to find Notes on the Need for Beauty at a local bookstore. 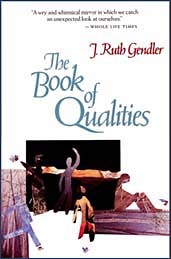 Click here to buy The Book of Qualities. *Please note that this is not the fastest way to order. *Your book(s) come signed by Ruth Gendler when purchased directly from Turquoise Mountain Publications.